With a history stretching back to 1950 when Basil Leonard Read established a small construction engineering company in Boksburg, Basil Read has now firmly established itself as a best in class provider of construction and mining services across Southern Africa. Spanning six divisions, Basil Read has built up a reputation of quality, expertise and safety in the delivery of any major project, RGN speaks to acting CEO Kathutshelo Mapasa to take stock of the company’s success and find out what is driving the next growth strategy. Basil Read implemented a strategy to bring the group of companies operating in different sectors under one name with a number of divisions. In the construction sector, it has completed major projects predominantly for South Africa’s large public entities, laying thousands of kilometres of roads for the South African National Roads agency. It has also undertaken several civil and pipeline projects for Eskom on power plants across the country. The developments division is also building cities from brownfield cites in Cape Town and Johannesburg, as well as being involved in constructing schools in partnership with the National Education department. These include major new districts such as Savanna City, comprising 18,000 new houses, and Malibongwe Ridge an extension of Johannesburg’s Cosmo City. Basil Read has recently completed the construction of an airport on the island of St. Helena, a remote landmass in the Atlantic Ocean. Mapasa says undertaking a project with such logistical challenges was a major success for the company and will stand the firm in good stead as it seeks to demonstrate its capabilities and replicate such projects across Africa. Finally in the mining industry Basil Read has been heavily involved in some of sub-Saharan Africa’s biggest resources projects. In this area Basil Read operates as a mining services provider, with the capability to run the whole contract mining side of a project. That includes the whole mining value chain from drill and blast to upfront mine designs and mobile plant optimisations. Basil Read is currently working on major projects across Southern Africa in a range of different minerals. In South Africa, there is a business partnership with De Beers Consolidated Mines for the Venetia and Voorspoed projects to mine diamonds. In Botswana, the company is playing a fundamental role in the construction of the Cut 8 Phase 2 project for Debswana’s Jwaneng mine. In addition Basil Read is working with a variety of blue-chip, tier-1 mining companies throughout sub-Saharan Africa bringing major projects to fruition. The mining services sector in Southern Africa is extremely competitive and the recent commodity downturn has forced contract miners to streamline and demonstrate to the market specifically how they can reduce operating costs and improve profits in order to continue to win contracts. Mapasa says Basil Read has differentiated itself in the Africa contract mining industry through two key factors; safety and productivity. Firstly, when it comes to safety Mapasa sees it as an essential licence to operate. He identifies that clients place such importance on a strong safety record that he has implemented systems to place Basil Read as a best-in-class contractor when it comes to keeping employees safe – it also has a huge bearing on a company’s potential revenue. South Africa has historically suffered from huge numbers of people dying in mining operations. While the number has been drastically reduced from the multiple hundreds per year to around 70, the mining ministry retains the power to shut down operations until a company can prove it can safely operate a mine. That is a huge worry for a company as it can have a multi-billion-rand impact on revenue and therefore selecting a contractor with a focus on safety performance is a priority. “When companies go to outsource contract mining they need to be able to rely on a best-in-class safety operator before they even talk about the cost of the service and that is where we come,” asserts Mapasa. 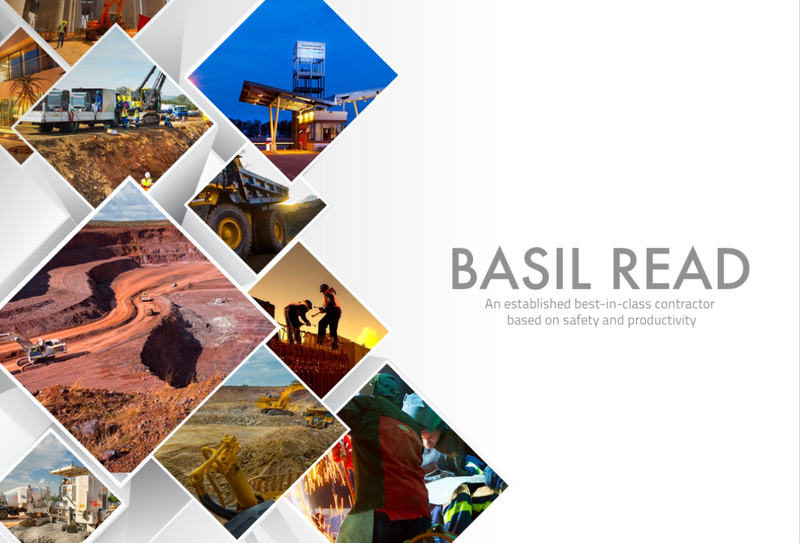 “We believe that as Basil Read as a contractor we probably have leading statistics from a safety performance point of view, to the point where we find ourselves leading the client in terms of safety. The ability to provide a safe service also relies on Basil Read’s supply chain providing the highest quality equipment. Particularly major global players such as Komatsu, Liebherr and Atlas Copco ensure all of the Boksburg-based company’s contract mining is using the best machinery. The second key plank to Basil Read’s offering is what it can bring in terms of boosting a project’s productivity. Mapasa portrays the service as an ability to bring a lean manufacturing concept to any project and reduce the unit costs by, for example, increasing the amount of tonnage or the final product delivery. Basil Read has demonstrated its effectiveness in this area at Vedanta’s Skorpion zinc project in Namibia. With the project’s economics putting it in the highest cost quartile, Vedanta approached Basil Read to bring operational costs down and a challenge to push the project into the second quartile of the cost curve. Mapasa declares that while Basil Read is not often the cheapest bidder at the tender stage it’s the company’s track record in safety and productivity gains that sets it apart and normally leads to repeat contracts. He cites a recent tender for a project in Botswana where Basil Read came third in terms of cost but its history of delivering the project on time, on budget and safely gave it the advantage over the competition. Traditionally, the South African firm has only occupied the contract mining space however things are starting to change on that front. Mapasa is targeting a full turnkey offering for future clients, using its experience and expertise to branch out the contract services and act as a long-term lifecycle partner for a sub-Saharan mining project – illustrated by a deal signed with Shumba Energy to develop its Botswana coal projects. The commodity price crash which savaged the global industry over the last few years put a particular strain on mining services providers. Clients were tightening their belts and either looking for value on a contract or improved returns on existing costs. Basil Read had to find ways to reduce its clients’ costs so they could remain profitable in the depressed market. Anglo American CEO Mark Cutifani has suggested for a mine to be operating at optimal efficiency, mining trucks should be in operation at least 6,000 hours per year. Mapasa took that figure as a benchmark for efficiency and now Basil Read has been able to demonstrate at least 6,000 hours per truck per year – a clear reflection of what the company can do in tough and challenging market. With commodity prices steadily returning across the board so too is the flow of capital for new projects and expansions. Basil Read is targeting a position as the go-to partner for any new mine construction in sub-Saharan Africa. While it will remain a diversified construction, engineering and development firm, Mapasa sees big opportunities to establish Basil Read as a market leader in the growing African mining services sector. “We will continue to pursue our blue chip-type clients, we are looking to expand on those relationships and see where that takes us. We have a very aggressive growth strategy in that sense,” Mapasa exclaims. “We want to exploit the growth opportunities in the mining business in Africa.